Our immaculate Scottsdale condo is set against the picturesque backdrop of the McDowell Mountains, situated within the upscale, gated Grayhawk community. Purchased new in 2004, we have added over $50k in upgrades to the interior, including beautiful 16’ Italian tile, plush carpeting throughout, 42” maple cabinets, granite slab counter tops with tumbled travertine, new furnishings, and high-end appliances with a full-size washer and dryer. It is spacious at 1,843-square-feet of living space, spread over a split floor plan, with an attached two-car garage, two generously sized bedrooms, and den. The Village at Grayhawk has gorgeous, landscaped grounds and offers three large pools, two workout facilities, and is less than two miles from the 101 freeway, sheltered from the noise and view of other streets. I purchased this luxury condo in 2004 as my primary residence. I very much enjoyed the condo and community right up until I got married and we built our new custom home also in North Scottsdale. We love the Grayhawk condo so much that we will eventually move back in our own retirement which is still a few years away unfortunately. In the Fall of 2014 we are pleased to announce that we have replaced and upgraded the carpet; replaced the toilets with one-piece high-end Toto models; and replaced the washer/dryer with high-end Samsung high-efficiency (HE) units. Oversized 2 car garage with opener. Bath and separate pool towels provided. Community has two fitness rooms. Two full-sized leather sofas, stuffed chair, fireplace, HD TV, DVD, CD, stereo. Full kitchen with all large and small appliances; all cookware, silverware, flatware, glassware. Grayhawk boasts some of the best golf in the world. Second floor unit with one easy flight of stairs. The open floor plan features a great-room design including a large living room, dining room, and fully equipped kitchen. The living room has a 58 inch Plasma HDTV screen, surround sound stereo, and lots of comfortable seating to maximize your enjoyment. The large dining room includes a spacious table w/ 6 chairs. The kitchen is fully equipped including cookware, flatware, dishes, glassware and small appliances. We found our stay here disappointing because it was not well maintained. The tile floor was dirty, the refrigerator so filthy I had to clean it before putting any food in, and the windows needed washing. The carpet had been cleaned and a cheap plastic hall runner was added over it. The coffee table had a huge water stain, one of four patio chairs was broken, the MBR nightstand drawer was broken, the bedspread had a long rip that was poorly repaired, and the sheets so worn there was no elastic in the corners. Two of the three bathroom sinks barely drained and burned out bulbs were not replaced. To us, this is not luxury. The owners seemed nice, but not interested in maintenance. We have had nothing but perfect 5/5 star reviews since we started 15 years ago. In their haste to say only negative things on social media instead of directly to us, these renters forgot to thank us for the wine and card we left to welcome them after a long trip at the beginning of their stay. Not to mention us giving them everything they wanted – and they were very demanding and rude. Not sure why they never mentioned any of these horrific issues to us during their stay but I guess there are all kinds in this world. We are so focused on providing a great experience for all our guests, we over supply the condo with amenities. We also renovate and update every couple years to keep it like new. Over the past 5 years we have replaced the carpet (and put a runner on the high traffic hallway at the request of a previous, more classy repeat guest). We also replaced the washer and dryer with high end Samsung models. Both toilets were replaced with luxury Toto units. The carpets and tile/grout are also professionally cleaned on a regular basis. We also proudly over supply the kitchen with more equipment and tools than most people have at home. I checked the refrigerator and it is clean with the exception of a couple water stains on the glass shelves so not sure what her concern was. The coffee table did not have a water stain on it so I am guessing she knows nothing about woodwork and not able to differentiate between wood stain and finish natural irregularities (because wood accepts stain differently based on grain and finish – that’s the beauty of it). Arizona is very windy and dusty so windows get dusty very quickly – impossible to keep up with 100% of the time. I did check and the windows were a bit dusty but not too bad. We have also received nothing but kudos about the cleanliness and consistent job of our cleaning staff. Most renters ask for the contact info of our cleaning company so they can use them also during their stay. I checked and found only one sink that drained slowly in the master suite (but it did drain completely after a minutes or so). FYI, in the master there are two side by side sinks 30” apart; the second sink drained very quickly. I will have a plumber come in at the next condo turn to fix the one sink. I gave these renters everything they "demanded" but still apparently (according to this review) they were not satisfied. My cleaning lady said hey left the place "extremely dirty saying she had never seen anything like it. They also destroyed all our brand new white towels" and a few items are missing from the condo. I confirmed and replaced the brand new white towels that had all been purposely stained by these vindictive renters. Not sure if anything would have satisfied them - professional complainers I think... we all know the type that eat all their food in a restaurant and then complain at the end in an attempt to get money back. They will not be coming back to this condo ever again. I like this property very much! I will use it again in future visits. Nice size rooms, all the amenities you need. Challenged with garage door opener. May need to check it and make sure the battery doesn't need to be changed. Thank you Amanda for the kind review! It was great having you stay with us and we would welcome you staying at our condo anytime in the future. Thanks also for letting us know about the low garage remote battery. It has been replaced. Warmest regards. -Meryl & Linda. 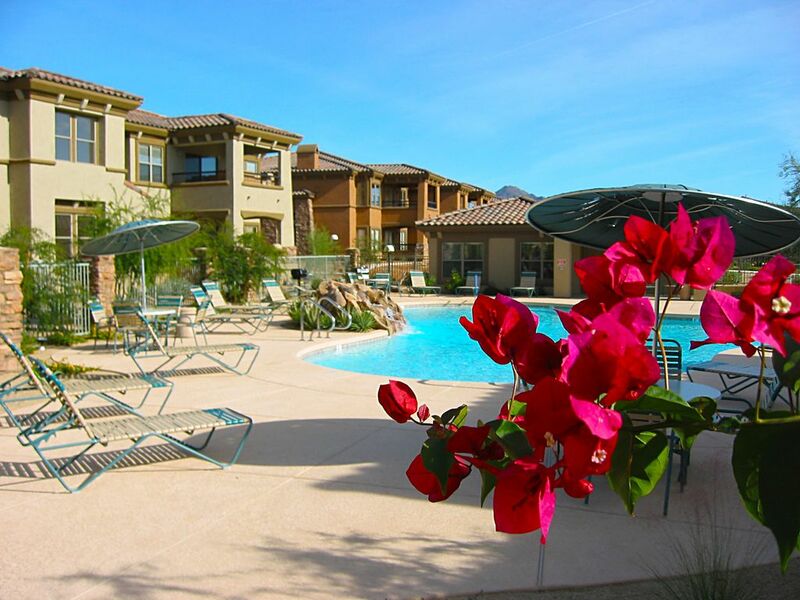 The Village in Grayhawk is close to restaurants and offers easy access to all of Scottsdale. The Village is quiet and the residents friendly. The owners thought of everything from plush towels to cooking tools. There is a covered porch overlooking an Arizona courtyard that allows one to be outside from breakfast to lunch. Thank you for the kind comments and for being such great guests. Please come back and join us anytime! We had a great time while staying at this property. It was everything that was described and more! Great location in North Scottsdale. The condo is well maintained and the kitchen had about everything you could think of. Felt like I was in my own home! Had slight issue with lock box for getting in first day, and Meryl took care of it immediately. Would highly recommend this property for anyone looking to stay in Scottsdale. Thank you Nancy for the nice review! We take pride in making our guests feel at home so your feedback is special to us. Thanks for being great guests! We look forward to having you stay with us in the future. Meryl and Linda’s lovely condo is well appointed and well maintained. We didn’t lack for anything. The master bedroom bed was very comfortable. The condo is a short walk from a pool and hot tub. Every time we used those facilities we were the only ones there. The condo development was very quiet. This unit is close to a large shopping center with a great grocery store and many other stores and restaurants. Close enough to walk. My husband and I were here alone, but the large unit could easily accommodate two couples. We definitely recommend this home. Thank you Brandilyn! You guys are welcome anytime. Very spacious luxury and equipped apartment! Nice surrounding. Good gym and swimming facilities! Good communication between us and the owner! Thank you for your kind comments Jose! It was very nice having you both stay with us all the way from the Netherlands. We hope to have you back next year. The Grayhawk Community itself offers the acclaimed Grayhawk Golf Club, which includes an award-winning 40,000 sq. ft. clubhouse, complete golf shop, locker rooms, exquisite indoor dining, or alfresco dining at Phil's Grill and the Quill Creek Cafe. Grayhawk residents and guests also benefit from features such as 30 miles of hiking, biking and jogging trails, as well as tennis and basketball courts. Great location in north Scottsdale. Roughly 1 mile to the FBR Phoenix Open, walking distance to the Fry's Open PGA tournament at Grayhawk, 2 miles to Barret-Jackson, 2 miles to Kierland and Desert Ridge high-end outdoor shopping and entertainment, 1 mile to Market Street shops and restaurants, 20 minutes to the airport, 30 minutes to the NHL Coyotes arena and NFL Cardinals stadium. Tons of restaurants, shopping and world-class golf close by. Spring Training MLB baseball within 20 minutes of our condo. Other Activities: hiking, world class golf, shopping, restaurants. Rate Details: $2400 to $4500 per month.